hightouchmegastore: The Way to Grace. Tonight, I saw you in Pocatello, Idaho, just past the parking lot of an Applebee's. It seems to me that I have crossed you before, although I never before saw the sign. Your sudden appearance raises a few questions for me. 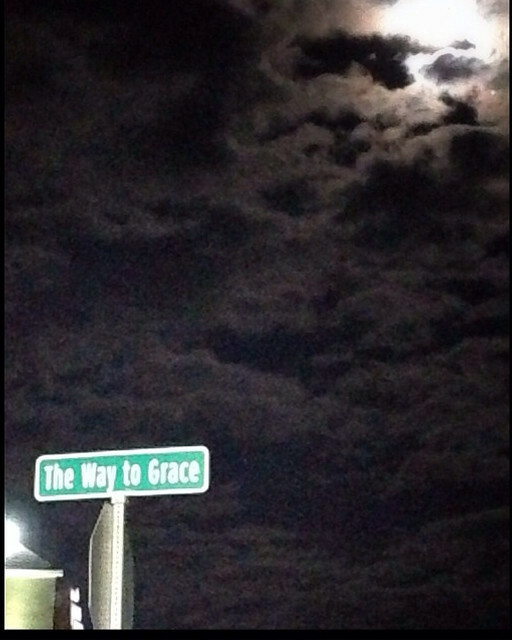 Are you, The Way to Grace, only a Pocatello thing? Or are you in other Idaho towns? Is Applebee's on The Way to Grace? Or was that just coincidental? Perhaps it was that enormous wedge salad I ate, or the small headache I had from driving? Although I don't think it was an hallucination. Was it the hour, after dark? the season, late? the particular crossroads? Will you appear to me again when I least expect it? I know I will think of you. If I want to find you, where shall I look? Is there a GPS to take me to the Way to Grace? PS I could use an Applebees!